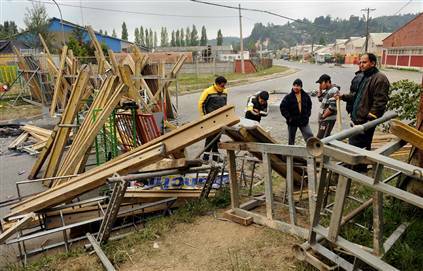 In the wake of the earthquake, hundreds of Chilean survivors are forming organized neighborhood watch groups, arming themselves and barricading streets to protect their homes from looters. The groups have taken over the role of security since the police were overwhelmed by looting and soldiers were not able to restore order quick enough after the disaster. Looting seems to be a common theme in natural disasters. When the grid goes down for a period of time and the first responders become overextended, 1) the less savory people of society see it as a free for all and go on a looting spree, and 2) when people become desperate enough due to lack of food and supplies they often resort to looting as well. This is especially problematic in an extended grid-down situation. To reduce inventory and the associated carrying costs, modern grocery stores receive their inventory “just in time” for the next day’s demand. When that supply line gets held up for whatever reason, those who are dependent upon the goods in that store go without. These Just in Time (JIT) supply strategies allow for no extended stock of food and supplies — which is why we see the shelves become empty prior to impending storms. The longer the supply is gone the more desperate people become. That wouldn’t happen here right? After all aren’t we a “civilized” country? Think again, it happened in Louisiana after the Katrina disaster and if another major disaster comes — economic or otherwise — it will happen again. You must be prepared: Food (and water) storage is absolutely essential. A minimum of 3 months but ideally one year’s worth or more. For more info on how to get started with food storage be sure to read my Food Storage Basics article series. Get to know your neighbors: Similar to these Chileans, banding together provides safety and security and besides, you can’t expect to man a 24/7 watch all by yourself. Get to know your neighbors now, before disaster strikes. If possible, come up with neighborhood disaster plans and discuss the possibility of how the neighborhood would respond to looters. Arm yourself: When the law is not around and the lawless run amok, you are the last line of defense for your family. Just having firearms is not enough. Be sure to get the proper training. There are numerous civilian training schools around the country that teach personal defense with a firearm. 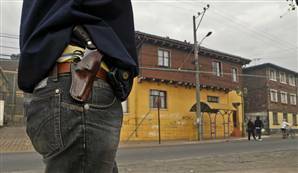 Beef up the security of your residence: Having a secure home is a good idea even without a mob of looters running around. Now’s the time to increase the security of your residence before the zombies come a’knocking. Chile earthquake: Why do people loot? – A look into the psychological reasons people loot.